"This is a cake in a pie crust with a delicious chocolate layer. Serve warm with ice cream or sweetened whipped cream. Pecans may be substituted for the walnuts." In a small pan, melt the chocolate with the water. Stir in 2/3 cup sugar. Heat to boiling, stirring constantly. Remove from heat. Stir in butter or margarine and 1 1/2 teaspoons vanilla. Set aside. Blend together flour, 3/4 cup sugar, baking powder, salt, shortening, milk, and 1/2 teaspoon vanilla with an electric mixer on low speed to mix. Beat on medium speed for 2 minutes. Mix in the egg. Beat 2 minutes more. Pour batter into the pastry lined pan. Stir chocolate mixture, and pour over batter. Sprinkle with the nuts. Bake in a 350 degrees F (175 degrees C) for 55 to 60 minutes. Serve warm. Allrecipes cook Kelly shares her Peanut Butter Cookie Pie recipe. 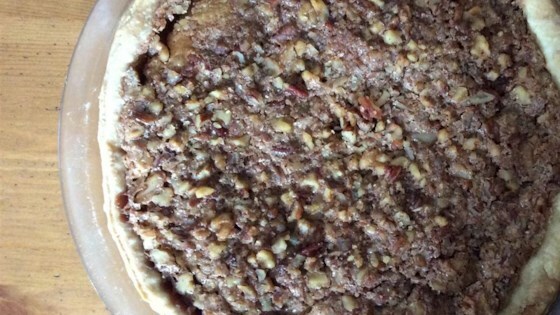 This was my mom's "special" pie growing up. We all loved it and it was fancy enough to bring to dinner parties. I did not care for this recipe AT ALL. More like cake. The batter spilled over on both pies and made a mess. Made this as a request from a co-worker, his mom used to make it for special occasions and had passed away a few years ago. Great pie!! lesson learned though...USE A DEEP DISH PIE SHELL!